You are currently browsing articles tagged TFP. Many gave some, Mr. Fred gave all! Mr. Fred Porfilio shouting slogans through a mega-phone, during a TFP Street Campaign. “Our Lady loves us!” In the moments when the daily routine was the most difficult, one could often hear these words escaping the lips of fellow TFP member, Frederick Vincent Porfilio, better know as “Mr. Fred.” He had a keen notion of man’s contingency and the need of an unlimited confidence in the maternal solicitude and intercession of the Blessed Virgin Mary. Mr. Fred was born of Italian immigrants in New York on September 28, 1939 and lived most of his life in the Bronx. He was a man of many talents and tried his hand at several professions. He was a taxi cab driver, carpenter, Army paratrooper, bartender and even an actor. The fact that he never persevered in any of them was a sure sign that Providence had other designs for this soul that would one day selflessly dedicate itself to the cause of defending Christian civilization. Mr. Fred's military patches and insignias from his days as an Army paratrooper. When Mr. Fred met The American Society for the Defense of Tradition, Family and Property (TFP) in 1975, he had already discerned the emptiness of everything the world had to offer him. Like the prodigal son returning to his father’s house, he left the world behind to embrace once again the Faith of his ancestors. He once confided to me that, when he was aspiring to an acting career, he had to put on airs to impress the “talent sharks.” Seeing the hypocrisy in this, Mr. Fred resolved one evening to tell his would-be mentors what he really thought of them, thus closing the door forever on his acting career. Many years later, Mr. Fred would put his acting skills to good use in plays and skits for friends, youth and supporters at TFP conferences. Mr. Fred stood out for his readiness and dedication to the many duties required of TFP members. He excelled in street campaigning and could always be counted on to shout slogans, sell magazines or distribute fliers. He was also ready to travel across the country and back when duty called. Among his many talents were his carpentry skills. He made everything from beds to kneelers and even a huge medieval banquet table. As every good Italian, he was often found in the kitchen providing a tasty repast. Guinness World Book certificate presented to Tradition, Family and Property (TFP) for its record 5.3 million signatures in defense of Lithuanian Independence. In the last years of his life, Mr. Fred stood out for his leadership qualities. He was asked to lead a “caravan,” a group of young volunteers, which would travel the country in a massive petition drive collecting signatures for the independence of Lithuania. In 1990, Lithuania sought freedom from the tyranny of Soviet communism. In a worldwide effort, the TFPs collected more than five million signatures, across five continents, in what the 1993 Guinness Book of World Records termed the largest verifiable petition drive in history. During this singular campaign initiative, the TFP caravans put in many miles and exhausting hours driving and visiting cities all across America. The caravans in the United States alone collected more than 800,000 signatures. During the long days, and the nights, the members were giving their all. During this campaign, Mr. Fred was an example of dedication and enthusiasm. It was also at the height of this true service to Christian civilization that Divine Providence called Mr. Fred through a tragic car accident. On September 3, 1990, Mr. Fred died as a passenger in a van that accidentally went off the road and turned over in Tennessee. God also called to Himself a young member of the caravan, Daryl Huang, who was the son of Chinese immigrants and was most dear to Our Lady in the short service he rendered to her cause. Members of TFP delegation presenting (then) Lithuanian President Vytautas Landsbergis with a parchment documenting TFP's monumental effort for his country. Thirteen TFP volunteers traveled fourteen hours from Pennsylvania to Fort Benning in Columbus, Georgia, to show their support and gratitude to our brave troops on November 19 through 22, 2009. They also made the trip to counter-protest leftist pacifists at the gates of the military base. The thirteen young men were treated to some glaring contrasts that made the long trip a memorable one. Gathered at the intersection of 13th Street and Broadway, the volunteers unfurled two large banners reading: “The American soldier guarantees the peace, not socialist protesters,” and “We are proud of our military heroes. May God bless and protect them!” The banners were accompanied by hand-held signs calling for passersby to “Honk for our brave troops!” The result was a cheerful chorus of honks from the majority of vehicles, from large trucks, police cars and even ambulances crossing the busy intersection. 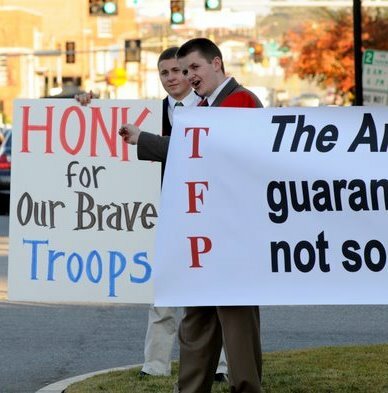 TFP Members Thomas Schneider and St. Louis de Montfort Academy Student Thomas Pinelli encouraged passing motorist to support "Our Brave Troops." While in town, the TFP volunteers toured the newly opened National Infantry Museum, described by Major General Jerry White as a “multi-million dollar love letter to the American soldier.” The museum is simply awe-inspiring. Dedicated to the courageous infantry soldiers that have defended our country, the museum brings to life many historic wars and battles with sophisticated sound and visual effects, cast figures of real infantry soldiers and numerous historic items from actual battles, such as a Bradley Fighting Vehicle that was damaged by terrorists in Iraq. The museum also sports a shooting range with M-4 and M-16 rifles modified for electronic target practice but still kick like the lethal versions. The glass encased Hall of Valor honors the nearly 1,500 infantry recipients of the Medal of Honor. 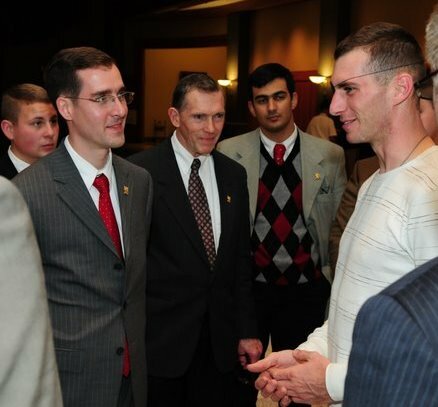 War Hero Peter Sprenger (right) took time to speak with TFP members at the newly opened National Infantry Museum. 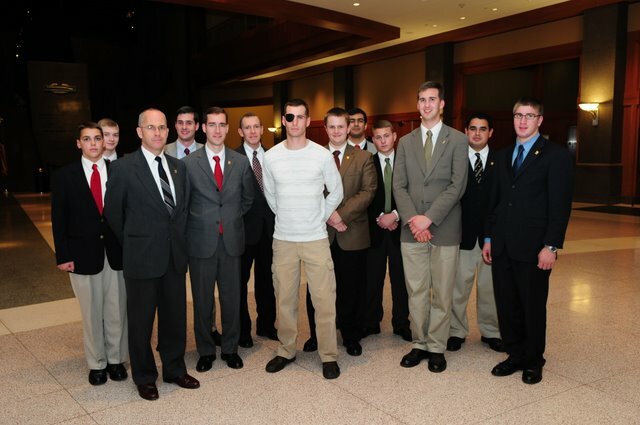 To make their tour of military history even more vivid, the TFP volunteers chanced to meet a newly commissioned 2nd lieutenant with an eye-patch over his right eye. His name is 2nd Lt. Peter Sprenger, the young soldier who sustained serious injuries including the loss of one eye to a suicide car bomb attack while serving in Iraq in 2003. 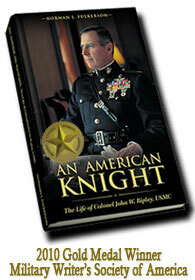 This brave wounded soldier defied all odds and skeptics by passing U.S. Army Ranger training and going back to combat. Then, because of his exceptional dedication, the Army decided to grant him entrance into Officer Candidate School which he recently completed, receiving his 2nd lieutenant’s insignia from General David Petraeus himself. The TFP volunteers chatted with the unassuming soldier who, when told why the TFP volunteers were in town, thanked them for their support and gratitude. When he stated he was from California, the volunteers told him about the TFP campaign there in defense of traditional marriage. Lighting up, 2nd Lt. Sprenger said, “I voted for Prop. 8!” referring to the bill that protected marriage as between a man and a woman. As each volunteer bade him farewell, they could not but think they shook the hand of a true hero, one willing to lay down his life for his country. 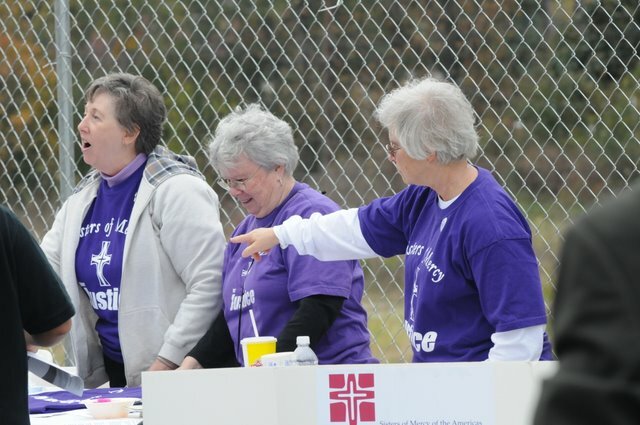 Liberal Nuns who saw no problem being associated with those who openly promote Communism. pro-homosexual activists and many students from Jesuit high schools and universities. 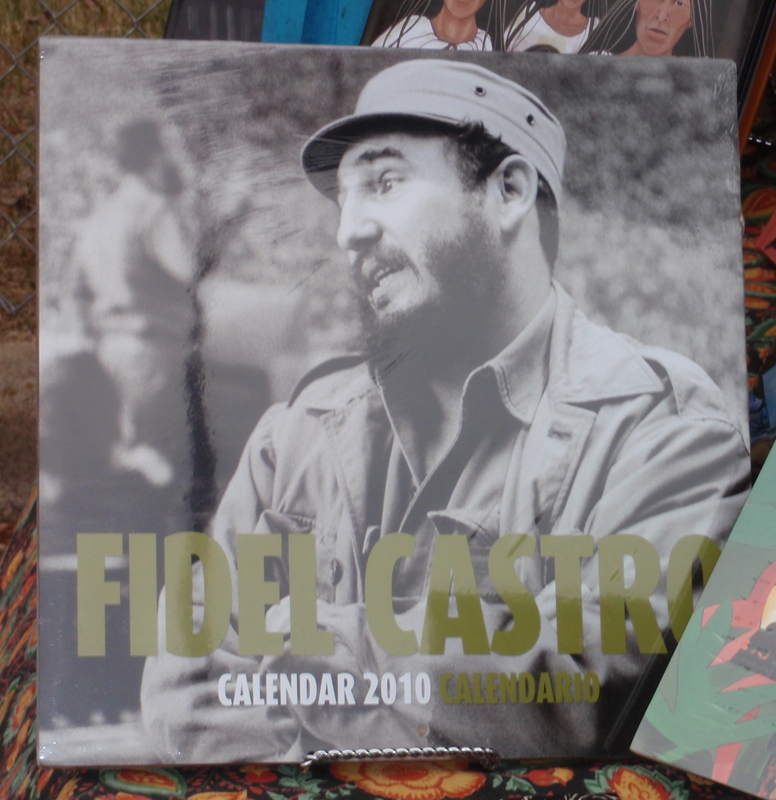 Right next to tables manned by leftist Catholic nuns was a well-frequented tent of a radical communist bookstore called Revolution Books that sold Che Guevara and Fidel Castro wall calendars and atheist communist literature calling for open Marxist revolution. Wait. Didn’t the Berlin Wall fall twenty years ago? Apparently, liberation theology and the subversive communist ideas that built the wall are still alive. 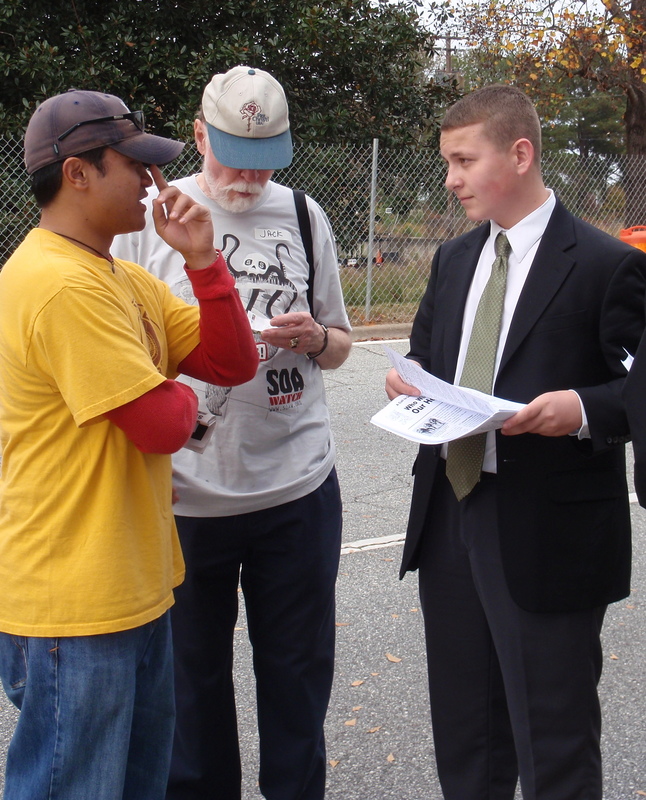 Distributing the “A Call to Gratitude: Who Will Thank Our Heroes?” fliers among the pacifists. It is experiences like these that help one to better appreciate the heroism and sacrifice of soldiers like 2nd Lt. Peter Sprenger. Oftentimes, we need stark contrasts to awaken in us the admiration due to men of honor and to help us loath the harmful ideologies of pacifism and Marxism that seek to disarm and dishonor hallowed institutions like our military. May God bless and protect our heroes as they defend us from our enemies!